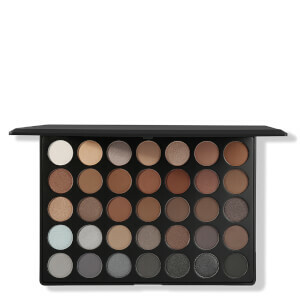 Create show-stopping eyes with the Morphe 35W Warm It Up Eyeshadow Palette. 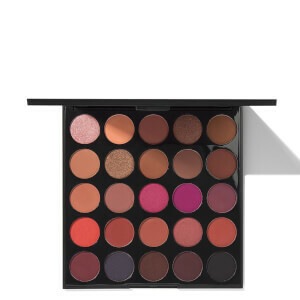 Combining 35 matte and shimmer eyeshadows, the warm palette allows you to create an endless range of looks, from subtle and smokey to daring and dramatic. Buttery rich and highly pigmented, each striking shadow applies effortlessly, delivering unmistakable colour that blends effortlessly to create a diffused and professional-looking finish. 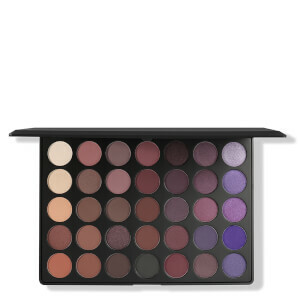 Pairing complementary shades of warm bronze, plum and peach, the versatile eyeshadow palette is a makeup bag must-have. Row 1: Buff, Half & Half, Ready, Gown, Bridal, Sand, Prime. Row 2: Value, Boy Bye, Link, Last Call, Petal, Fading, Fascinating. Row 3: Rosie, Vows, Hushing, Romantic, Wifey, I Love You, Bells. Row 4: Russet, Bay, Pledge, Newly, Gentle, Dahlia, Hitch. Row 5: Knot, Untainted, Toasty, Appraise, Wedlock, Tie, Lace. Påfør direkte på øyelokkene. Bruk lysere farger som en base, medium farger i folden og mørkere farger i øyets ytre "V". Talc, Mica, Mineral Oil, Kaolin, Titanium Dioxide, Magnesium Stearate, Isopropyl Palmitate, Lanolin, Methylparaben, polyparaben, propylparaben. May Contain: Mica and Titanium dioxide, Iron Oxides, Manganese Violet, Ultramarine Blue, Chrome Oxide Green, Hydrated Chrome Oxide Green, FD&C Red No.40 A1 Lake, FD&C Yellow No.5 A1 Lake, FD&C Blue No.1 A1 Lake.